During a two-day official visit to Iceland (20-21 April), Wen Jiabao, Premier of the State Council of the People′s Republic of China, met with Iceland′s Prime Minister Jóhanna Sigurðardóttir and President Ólafur Ragnar Grímsson. Premier Wen, who holds a degree in geology from the China University of Geoscience, also visited various interesting geological sites during his stay in Iceland, and had requested a meeting with Director Ingvar B. Fridleifsson and students of the UNU Geothermal Training Programme (UNU-GTP). To date, 78 scientists and engineers from China have received specialized training at UNU-GTP in Iceland; several of them are now among the leading geothermal experts in China. UNU-GTP Director Fridleifsson and eight UNU-GTP PhD and MSc students met with the Premier at the Hellisheidi geothermal plant. Also present at the meeting were Össur Skarphédinsson, Minister for Foreign Affairs of Iceland; Árný Sveinbjörnssdóttir, professor of geology at the University of Iceland; Bjarni Bjarnason, Director General of Orkuveita Reykjavíkur (Reykjavik Energy); and Chinese media and other officials. Three UNU-GTP students — Pacifca F. A. Ogola (PhD), Kenya; José Roberto Estévez Salas (MSc), El Salvador; and Huang Jiachao (MSc), China — summarized their projects and geothermal resources and utilization in their home countries. Jiachao graduated from the same University as Premier Wen, as have many of the former UNU-GTP students from China. After the presentations, the students had an opportunity for interactive discussion with the Premier. Asked whether geothermal resources would be included in the future climate mitigation plans of China, the Premier replied that geothermal is already included in China’s climate mitigation plans and will play an even larger role in the next revision of the mitigation plan. As one of the most populous country in the world, and blessed with geothermal resources in almost every province, China’s efforts in geothermal energy development have the potential to play a major role in global climate change mitigation by replacing coal with the use of geothermal heat pumps. For comparison, about 30% of the total primary energy in industrialized countries of Europe is used for space and water heating alone. The Premier presented the UNU-GTP students and staff with geologically related gifts from his home country. It is expected that this visit will further strengthen the relationship between Iceland and China, as well as between the UNU and China. Top row, from left: Andemariam Teklesenbet (Eritrea); Thecla Mutia (Kenya); Ingvar B. Fridleifsson, UNU-GTP Director; Pacifica Ogola (Kenya); Sylvia Malimo (Kenya). 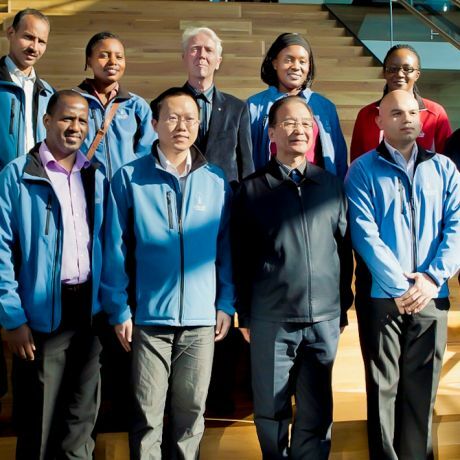 Bottom row, from left: Malfridur Omarsdottir (UNU-GTP staff); Charles Muturia (Kenya); Huang Jiachao (China); Chinese Premier Wen Jiabao; José Estevez (El Salvador); Luis Aguirre (El Salvador).